The market for laboratory-developed tests (LDTs) is evolving as the result of a mix of technological, financial, and regulatory factors. Broad technology platform shifts are underway. Serological and molecular diagnostic tests are becoming less popular as newer genomic and mass spectrophotometry (MS)–based tests are introduced. BCC Research has also observed that large national and regional reference laboratories are performing more LDTs, while smaller or academic laboratories reduce their testing volumes. High capital costs and low rates of reimbursement are hindering the efforts of smaller laboratories to keep pace with their larger counterparts. LDTs are part of the realm of clinical diagnostics. The critical legal distinction is that an LDT is performed as a service. Unlike other clinical diagnostic tests, LDTs are not subject to standard regulation by the FDA in the United States. Rather, LDTs are regulated under the Clinical Laboratory Improvement Act of 1988 (CLIA) to ensure that such tests satisfy their stated claims. An LDT cannot be produced by any laboratory other than the one that is offering it. Although a given laboratory may receive reference samples from other laboratories and return LTD results as a service, it is not allowed to market the actual components of the test to the general public. The LDT market is projected to grow from nearly $11 billion in 2016 to almost $14.9 billion in 2021, reflecting a compound annual growth rate (CAGR) of 6.3%, according to BCC Research’s study, Laboratory-Developed Testing: Technologies and Markets. Reference laboratory revenue will increase from approximately $9.4 billion in 2016 to $12.7 billion in 2021, at a CAGR of 6.3%. 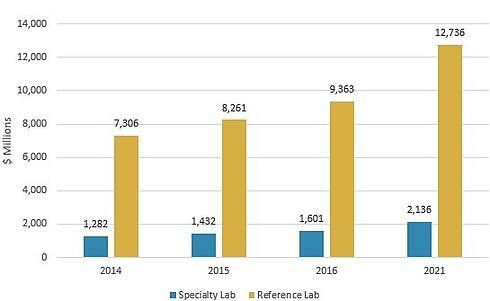 Specialty laboratories will post a 5.9% CAGR to reach $2.1 billion in 2021, up from $1.6 billion in 2016. Regulatory pressures are affecting serological and molecular diagnostic tests. Recent scrutiny of LDTs by the FDA has focused on these particular segments of the market. Also, their maturity means that many of these tests are either becoming FDA-regulated clinical diagnostics or are transitioning to newer technology platforms. MS-based tests have long been a key part of the LDT marketplace. However, the increased sensitivity of such technology is being leaned on for a variety of applications that have traditionally been dependent on serological testing. In addition, new applications based on our increased understanding of therapeutic drug monitoring and DNA analysis are increasing the opportunities for this platform to be used with LDTs. The Protection of Access to Medicare and Medicaid Act (PAMA) is expected to reduce LDT billing revenues in the serology, molecular diagnostics, and anatomic pathology sectors. In addition, LDTs have become a key target for private payers trying to reduce costs for their customers. Genomic testing has matured enough that laboratories are investing significantly in sequencing equipment, and genomic-based tests are rolling out on these new platforms. Revenues from the genomic testing sector will grow from $2.1 billion in 2016 to $3.9 billion in 2021, at a CAGR of 12.9%. Tests are being introduced that both replace and complement existing molecular diagnostics. They are also creating opportunities for pathologists to perform analyses that have heretofore been technically difficult or even impossible. In particular, matrix-assisted laser desorption/ionization time of flight MS has proven to be popular for the detection of nucleic acid variants on a chromosomal level with high precision and without having to use standard molecular diagnostic techniques. In recent news, Bionano Genomics and Genoptix announced that they will codevelop diagnostic assays for some blood cancers using Bionano’s genome mapping technology. The companies seek to demonstrate that Bionano’s technology is “a more efficient, scalable, and powerful tool for looking at structural variants that are relevant for cancer in a diagnostic setting” than the fluorescent in situ hybridization (FISH) and karyotyping methods commonly used today, Bionano CEO Erik Holmlin says. The companies plan to develop the diagnostics using Bionano’s genome mapping system, called Saphyr, which can be used to identify genomic structural variants. Details of how the tests will be commercialized are still being determined. However, Bionano will probably perform internal development of the reagents and bioinformatics. Genoptix would then purchase instruments and consumables from Bionano, do its own validation studies, and run the LDTs through its CLIA-certified laboratory. The Saphyr system works as follows. Long DNA molecules are labeled at specific sequence motifs. Next, the DNA is loaded onto the Saphyr chip, where it is linearized in nanochannel arrays. The Saphyr instrument images the DNA molecules, which can be assembled into optical maps. The technology can be used to help with de novo assembly and to identify large structural variants. BCC Research’s June 2017 study provides an analysis of global market trends for LDTs, with data from 2014, 2015, and 2016, and projections of CAGRs through 2021.